We had previously covered some of the best clipboard managers for Android. Today, it’s time for macOS. Since macOS doesn’t have an in-built clipboard manager, you’d need a third-party tool. Don’t spend your time searching among thousands of tools. We’ve prepared a list of the best clipboard manager for Mac. 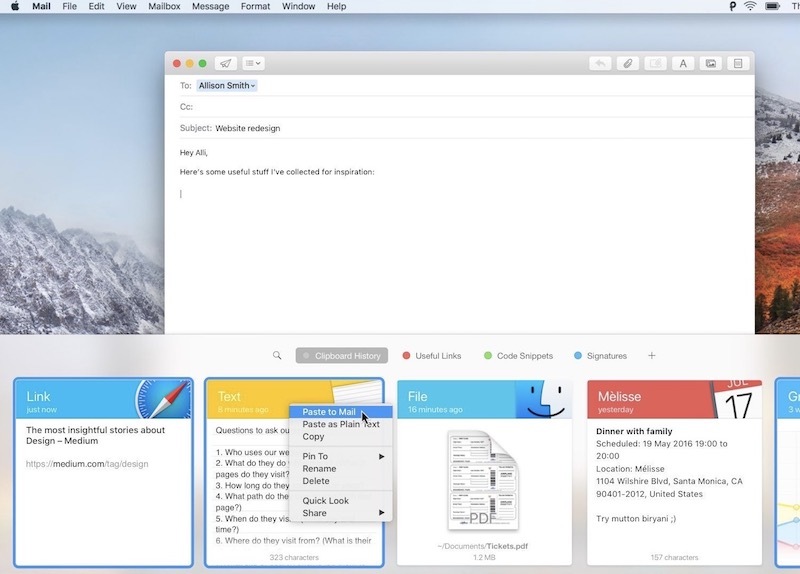 We tested around 20 Mac apps that offered clipboard management. Some of them were impressive, some were not. 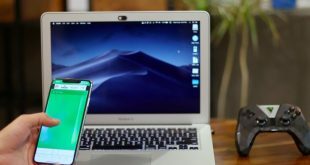 At the end of the day, we have come down to 7 best clipboard managers for Mac, offering various levels of features and productivity. We will start with the simple ones! Just so you know, CopyClip is my personal favorite when it comes to clipboard managers. It comes from FIPLAB, a popular developer of utility software. For one, CopyClip does not come with fancy features. Despite that, this simple tool will boost your productivity like never before. It seamlessly integrates with your Mac, which is great. It can record a big number of text-based entries, but you can decide how many entries are shown in the interface. There are also some customization options like blacklisting. 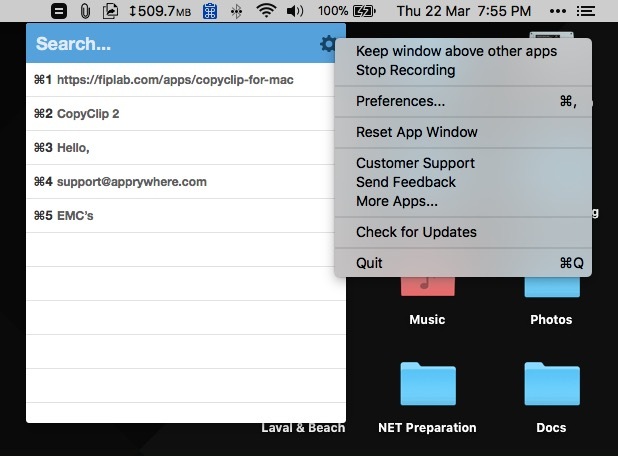 It means that you can configure CopyClip to not record entries that are recorded from certain apps. Cons: It can record only text. The Verdict: If you are someone like me, who loves minimal clipboard management, CopyClip is perhaps the best choice. You don’t have a fully-fledged interface or additional features. 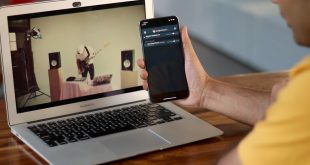 But, when it comes to recording clipboard entries and accessing them quickly, CopyClip is just great. You can also disable recording or enable ‘clip copied’ notifications through the preferences. You guessed it right. CopyClip 2 is advanced — and paid — version of our first recommendation. It does offer a few extra features that are not present in the free version. There is also some room for customization and optimization. If you need better control, hotkey support, and other options, CopyClip 2 is a great choice. 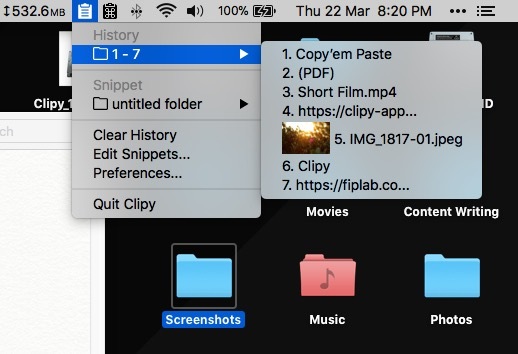 Unlike the free version, CopyClip 2 can record non-text clipboard entries too. For starters, CopyClip 2 lets you set up hotkeys for toggle the window. Instead of going to macOS menu and clicking on the CopyClip 2 icon, you can simply open the window. In addition, there is an option to search for all the recordings, which isn’t present in the free version. You can also decide whether you want to paste the content directly and whether you want to paste formatted text. The Verdict: If you found CopyClip inadequate for control and customization, CopyClip 2 is the next best one to go for. If you ask us, CopyClip 2 offers a lot of features for the price you are paying. Personally speaking, we loved the search feature and UI customization. That having said, it would have been great if CopyClip 2 had a better-blending UI. 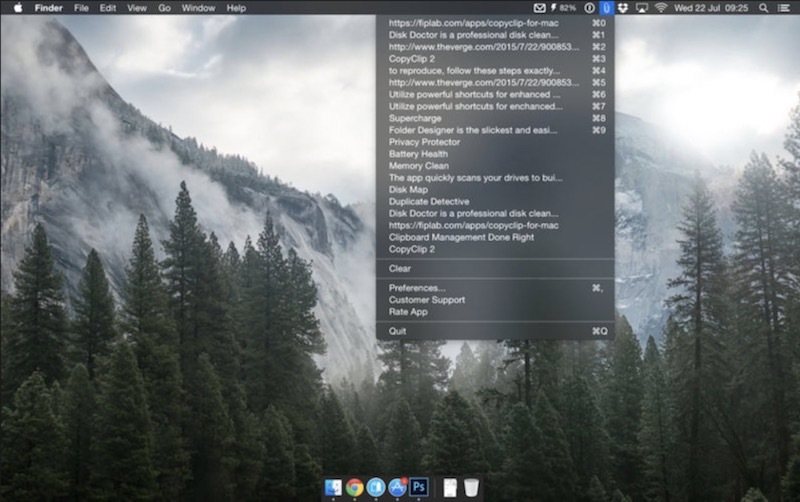 Clipy is often called the missing clipboard manager for Mac OS X. After testing the program for a while, we’d found it’s true. Clipy is the epitome of simplicity and productivity. In the first look, you’d find it as something really simple. However, Clipy offers better features than both of the clipboard managers we covered above. And, rejoice, Clipy is open-source. You can decide how many entries Clipy will record for you. We must say that we loved the Preferences very well. Despite being free, this tool can record images and other clipboard entries too. And, you can decide if you don’t want to record certain clipboard types. Some of the additional features include Snippet support, application blacklisting, and in-depth customization. The Verdict: Clipy is the perfect choice if you need a feature-rich, open-source alternative to both tools we’ve mentioned earlier. You will have better control over what you have copied — be it text, images or some PDF documents — while using Clipy. We don’t think that not many clipboard managers offer as many features as offered by Clipy. Just so you know, Clipy is a remake of Clipmenu, which is an abandoned project. Copy’em Paste lets you not only record clipboard entries but also manage them seamlessly. It offers a better organization method of clipboard entries when compared to other listings we’ve made. As long as running, it will record almost everything you copy — including media files. You can open the interface and keep them organized in a way you like. Copy’em Paste also packs a few features that we haven’t seen in other clipboard managers. For instance, it offers all the controls on the main interface. You can turn off/turn on recording, take screenshots, enable or disable plane-text mode and even delete the stored clippings. There are also different themes you can try for Copy’em Paste. Another notable feature lets you export and syncs your clipboard entries via iCloud, thus making it available across all of your devices. The Verdict: We’d say Copy’em Paste is one of the most feature-rich clipboard managers we have seen here. It packs every feature you need for recording and organizing different clipboard entries. We really loved its option for exporting, syncing and customization. Just so you know, Copy’em Paste is a premium macOS app, but the features are worth what you pay. You can find the full feature list on the official website. Pastebot is a clipboard manager for those who need better control over what they copy. Just like the others on the list, it too has an interface via the menu bar. However, when it comes to saving snippets and accessing something you’ve copied long back, Pastebot becomes a rockstar. It opens up a fully-fledged window that is showing a list of everything you copied. Just clicking on those entries will copy the text/file into your clipboard. When compared to other managers we have reviewed, Pastebot is smoother. There are some awesome filters too. For instance, using one of the HTML filters, you can convert lists into HTML codes. 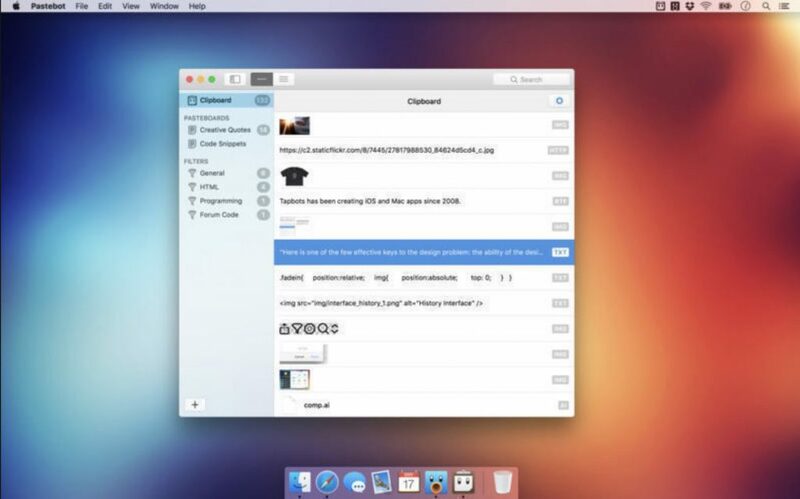 We’d say Pastebot would be a superb companion for a lot of coders out there. Cons: The menu-bar interface isn’t that intuitive. The Verdict: As we said, Pastebot is the best companion for people who copy a lot of stuff and coders. It has a bunch of features that enhance the total user experience, in addition to options like iCloud Sync, sequential pasting, custom pasteboards, blacklisting, and keyboard shortcuts. In short, Pastebot would be a great choice if you are looking for an advanced and feature-rich clipboard manager for Mac. Technically speaking, Unclutter isn’t a dedicated Mac clipboard manager. In fact, it goes a bit further than a clipboard manager. As the name says, Unclutter lets you make your desktop uncluttered. It does so by giving you space where you can keep your necessary files, clipboard entries, and even important notes. Just after you have installed the program, you can access this area from the menu bar. However, the clipboard manager section of Unclutters offers better features than what we have seen above. It records all the entries. It lets you organize saved clipboard entries. It even lets you edit the current entry. There is also a Star button to save the clipboard entries for later. Simply clicking on the entry will copy it to the current clipboard. The Verdict: If you prefer having a productive program alongside, Unclutter is one of the best ways to record and manage clipboard data. For the amount you are paying, you get a lot of features. You will love all these features if you are a professional user. So, even with the limitation that you should have the whole program on your Mac, Unclutter seems to be an awesome clipboard manager. We save the best for the last — Paste is probably the best clipboard manager for Mac that you can try right now! There are a few things that attracted us to Paste, the macOS integration being the best. Simply press the keyboard combination to launch Paste from the bottom part of the screen. From the grid-based view of clips, you can double-click to paste anything. The best part is that Paste saves an unlimited number of clipboard entries. In addition to normal entries, there is another section named Useful Links. Here, you can keep hyperlinks that you access regularly. You can also create customized lists where you can keep different types of clipboard entries. The visual display and many options in sync make Paste one of the best tools ever. 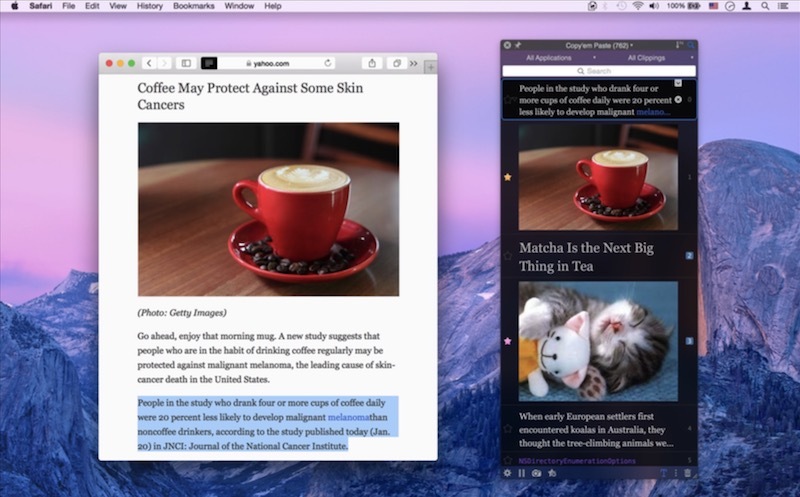 The Verdict: Paste is the perfect clipboard manager for everyone! The visual design makes it usable for most professionals. Also, we really loved the category options and hotkey support. In addition, you are getting the support for iCloud sync. 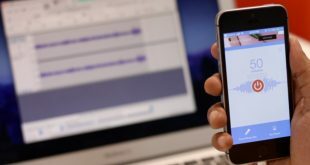 With a dedicated iOS app available, you will have access to all your recordings from anywhere. These will be our recommendations when you ask for the best clipboard managers for Mac. We have made sure that the article consists of different apps. For instance, if you need a simple tool for text-based clipboard entries, CopyClip and Clipy are best options. On the other hand, if additional features matter to you, Paste and Copy’em Paste should work fine too. Which is your favorite clipboard manager for Mac? Do let us know.